Abstract: Joint modeling of longitudinal and survival data is an active area of statistics research and becoming increasingly essential in most epidemiological and clinical studies. As a result, a considerable number of statistical models and analysis methods have been suggested for analyzing such longitudinal-survival data. However, the following issues may standout. (i) a common assumption for longitudinal variables is that model errors are normally distributed due to mathematical tractability and computational convenience. This requires the variables to be "symmetrically" distributed. A violation of this assumption could lead to misleading inferences; (ii) in practice, many studies are often to collect multiple longitudinal exposures which may be significantly correlated, ignoring their correlations may lead to bias and reduce efficiency in estimation; (iii) the longitudinal responses may encounter nonignorable missing; (iv) repeatedly measured observations in time are often interrelated with a time-to-event of interest. Inferential procedures may complicate dramatically when one analyzes data with these features together. 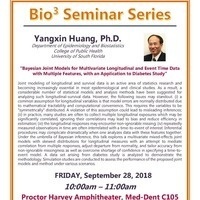 Under the umbrella of Bayesian inference, this talk explores a multivariate mixed-effects joint models with skewed distributions for longitudinal measures with an attempt to mediate correlation from multiple responses, adjust departure from normality, and tailor accuracy from nonignorable missingness as well as overcome shortage of confidence in specifying a time-to-event model. A data set arising from diabetes study is analyzed to demonstrate the methodology. Simulation studies are conducted to assess the performance of the proposed joint models and method under various scenarios.